The ORHD® series of work gloves were developed in the field with oil and gas professionals, utilizing direct feedback before being CE and ANSI lab tested to industry standards. The ORHD® series of gloves focus on high-visibility protection, crush/impact protection, cut-resistance and weather protection. The old cotton glove days are over and high-performance hand protection is required in this growing industry to reduce the heavy costs associated with hand injuries, for example, insurance claims and workdays lost. The ORHD® Knit CR3 isn’t your average knit nitrile glove. The 13-gauge machine knit polyester shell supports anatomically shaped thermal plastic rubber (TPR) designed to safeguard the knuckles, metacarpals and fingers from common impact and crushing injuries on the rig. The ORHD Knit CR3 goes one step further in protecting the user’s palm and fingers with a CE level 3 cut rating. Any roughneck will agree, maintaining a solid grip is a challenge. The palm of the ORHD Knit CR3 is padded and equipped with a durable nitrile coating, which is designed to restore gripping power and features a unique textured treatment that provides added traction in dry, oily and wet conditions. Encased in the nitrile-coated palm is 3mm padding to help soften the impact and vibration the hands experience on any given shift, especially on the rig floor. The ORHD Knit CR5 reduces the risk of cut and puncture injuries with a seamless 13-gauge knit shell delivering CE level 5 cut-resistance throughout the entire glove. In addition to powerful cut-resistance, the ORHD Knit CR5 delivers functional impact protection identical. Anatomically shaped TPR serves as the first line of defense against impact and crushing injuries by protecting the knuckles, metacarpals and fingers. The nitrile coated palm is textured and equipped with 3mm internal padding to help absorb vibration and restore grip when in contact with drilling mud and oil. CR5 protection goes beyond exceptional cut-resistance. It also provides incredible abrasion resistance, improving the life and longevity of the glove. ‘Struck-by’ incidents are common for major oil and gas producers. The ORHD® is specially designed to combat impact injuries and enhance gripping power during drilling operations utilizing TPR impact protection. Dual-density TPR is used to create an exoskeleton around from the user’s fingertips to their metacarpals. In many cases, TPR guards buy the user critical seconds during an incident to free them from situation. 2mm EVA foam lies beneath the hard density TPR knuckle guard to help disperse blows to the top of the hand, while the extended slip-on cuff protects the wrist. The palm is reinforced with durable microfiber and PVC bonded dots deliver durable gripping power in slippery conditions. 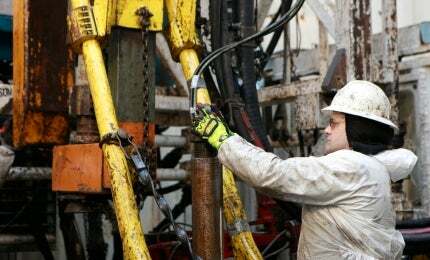 Severe abrasions and lacerations to the hand from prolonged hand tool operation on and off the rig floor has lead to the development of cut-resistant hand protection specially designed to safeguard rig hands. Rig hands in the oil and gas industry are often exposed to cut hazards leading to severe skin abrasions and lacerations to the palm and fingers. The ORHD CR5 provides CE Level 5 cut-resistance throughout the palm and fingers for maximum cut protection during drilling operations. Dual-density TPR safeguards the user’s knuckles and metacarpals from blunt force impact, while dual-density TPR with dedicated flex points provide critical pinch-point protection to the tip of each finger. 2mm EVA foam lies beneath the hard density TPR to help disperse blows to the top of the hand while the extended slip-on cuff protects the wrist. The palm is reinforced with durable synthetic leather and PVC bonded dots for durable gripping power in slippery conditions. Drilling fluids, hydraulic oil, diesel, and grease are all a part of the job. Improvements to waterproofing processes enable workers to protect their hands and remain free from the elements. Processes such as OutDry®’s lamination process, allow a breathable waterproof membrane to be directly bonded internally to the glove. This process seals water entry points more efficiently than a traditional waterproof bag, improving the overall fit and feel of a waterproof glove. The ORHD OutDry glove provides critical protection against on-site hazards with a breathable waterproof OutDry® membrane. Dual-density TPR safeguards the user’s knuckles and metacarpals from blunt force impact, while dedicated flex points provide critical pinch-point protection to the tip of each finger. 2mm EVA foam lies beneath the hard density TPR to help disperse blows to the top of the hand while the extended slip-on cuff protects the wrist. The palm is reinforced with durable synthetic microfiber and PVC bonded dots for durable gripping power in slippery conditions. Since the debut of the Original® glove at the 1991 Daytona 500, Mechanix Wear has built a reputation as the leader in hand protection. As a result of more than 20 years of research, development, design and innovation, Mechanix Wear offers a diverse line of gloves delivering superior fit, feel and function to your hands. Our mission is to look beyond conventional ideas and continue innovating the most advanced hand protection in the world. The ORHD® Knit CR5 is engineered for the rig and qualified for the industry. Leather gloves or synthetic leather gloves? The age old question that holds many of us wrench turners and DIYers up at the local hardware store. If you work with your hands, chances are you lean one way or the other and you've been buying the same pair for years. For decades, traditional leather gloves have been THE choice for heavy-duty work, and rightly so. The ORHD® OutDry® provides critical impact protection with a breathable waterproof membrane. OutDry® is directly bonded to the internal layer of the glove sealing any possible water entry point. The ORHD® Knit CR5 reduces risk on the rig by delivering CE level 5 cut-resistance and critical impact protection to working hands. The 13-gauge knit shell is constructed with CR5 cut-resistant material, delivering critical cut and puncture protection throughout the entire glove. Gain more control during oil and gas drilling operations with the ORHD® Knit CR3. The high-visibility shell is built with 13-gauge machine knit polyester that form fits the hand and delivers CE level 3 cut-resistance to the palm. The ORHD® CR5 provides CE Level 5 cut-resistance throughout the palm and fingers for maximum cut protection during drilling operations. The ORHD® is designed to combat impact injuries and restore gripping power during drilling operations. The Mechanix Wear® Original Glove® started the high-performance work glove category. Eighteen years of analysis, development and innovation have created 55 different styles of work gloves from the Original®. Hand protection supplier Mechanix Wear is to exhibit its innovative products at Offshore Technology Conference (OTC) 2015 in Houston, Texas, US, between 4 and 7 May. Mechanix Wear will be attending OSEA 2014, 2-5 December 2014 in Singapore. Mechanix Wear offers high-performance gloves that provide a superior fit, while enabling wearers to keep their hands functional. Visit Mechanix Wear at NSC Congress & Expo 2014 for more information about gloves for industrial applications. Mechanix Wear is set to exhibit at the 2013 Offshore Technology Conference and Exhibition, which takes place at the Reliant Center in Houston, Texas, US, between 6-9 May, 2013. Oil & gas drilling operations expose workers to numerous on-site hazards. Drilling safety managers demand a product that offers dorsal protection, reflectivity for improved visibility and awareness, extra grip for slip prevention, and critical impact resistance.